We all know that working from heights is a risky business, and is where the majority of work related accidents take place; it is for this reason that the use of the correct safety harness is crucial. When working from any height it is essential to use the right equipment and it is often the case that you will need more than one item. 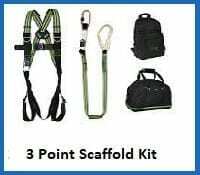 Here we supply specific safety harness kits to suit a range of applications. 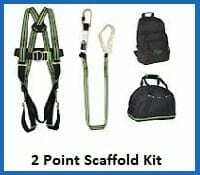 Safety harnesses come in a wide array of styles which suit various purposes, Rope Services Direct can supply lifting harness kits, to ensure you have all you need for specific purposes, such as a scaffolding kit, a construction workers kit and a restraint kit, there are also crane maintenance kits and work positioning kits. 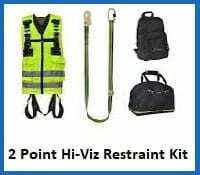 Our Hi-viz kits are great for low visibility areas and our basic restraint kit is ideal for everyday tasks. Our safety harness kits come with various anchor points, ranging from 1,to 3. 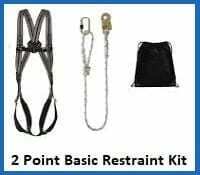 There are other types of harnesses available, these include sitting harnesses and rescue harnesses. Additional equipment is often used with safety harnesses; these include fall restraint or fall arrest systems, retrieval blocks, and safety lanyards. 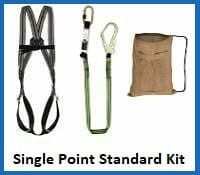 You can purchase this equipment direct from us, call us if you can’t see a page for the discussed products, we can nearly always supply them. 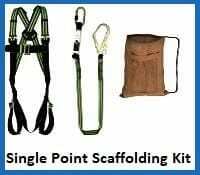 All safety harnesses designed to keep the wearer in the upright position should they fall, to allow quicker release, this can be vital because the forces implied by a fall can place much strain at the top of the legs where the straps sit and can cause loss of blood circulation to legs. This may have grave consequences if not loosened and if possible removed from the harness quickly. 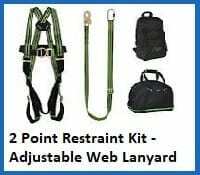 Remember to frequently inspect your safety harness for any wear or damage and if noticed, do not use and replace a.s.a.p. The Staff at Rope Services Direct are always happy to answer your questions and provide quotations as soon as possible, this can often be done whilst on the phone. Call 01384 78004 today, or email us here. 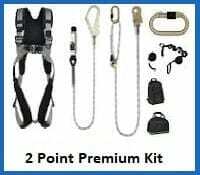 Safety Harness Kits Overall rating: 5 out of 5 based on 6 reviews.